A brighter approach to enhanced signal quality. These Fiber Optic mini nodes deliver an array of options to meet the specifications you require in a small compact housing. RFoG Blue and RF-PON Green are easily distinguishable. Powder Coat resists dirt and corrosion. Whether single or dual fiber applications are required, an advanced optical node is available to meet your system needs. -8 to +2 dBm. Extreme delivers the largest optical input range in its class. Installations & system management are that much easier. Optional WDM wavelength overlays allow architecture flexibility to meet your system requirements. Automatic Gain Control ensures a guaranteed output level for system reliability. FP, DFB, or CWDM Laser choices are available to ensure you get the exact product you need for your system. These high performance optical nodes are available with many user selectable options providing flexibility to meet the exact needs of your application. 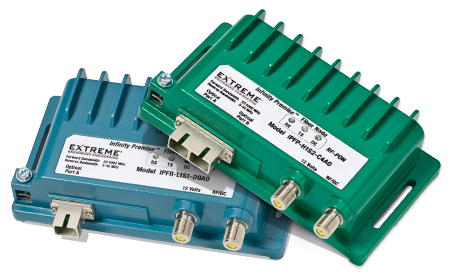 The Extreme Fiber Optic Mini Nodes are designed from the ground up to ensure excellent electrical and mechanical specifications for Fiber To The Home (FTTH) applications while at the same time offering easy and reliable installation.